SmartAgri champions take gold for best implementation at Western Cape Public Service Excellence Awards. 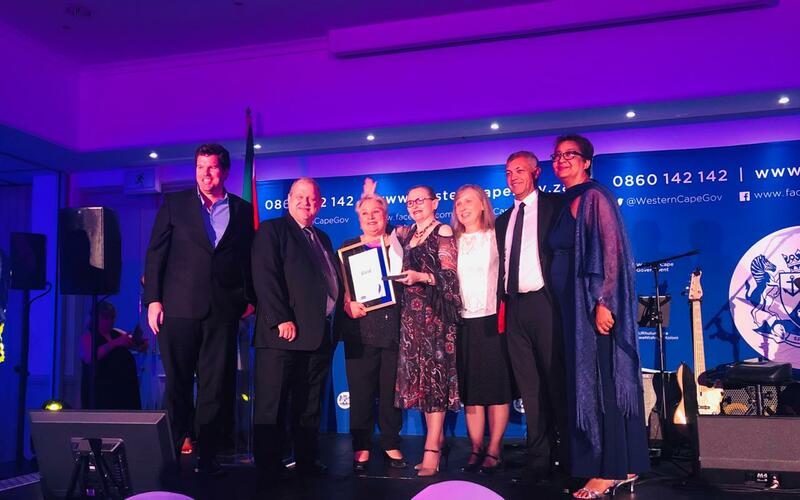 On Tuesday night the ACDI's collaborative project with the Western Cape government's departments of Agriculture and Environment & Development Planning was awarded top honours at the province's Public Service Excellence Awards. Professor Stephanie Midgley, Goosain Isaacs (DEADP), Mike Mulcahy (GreenCape) and Dr Ilse Trautmann (project leader and nominator of the project in the PSEA 2018) accepted gold in the category 'Best Implemented Programme" for the implementation of SmartAgri in the Department of Agriculture and the agricultural sector. "This award is recognition of the fact that we didn't just put a plan on the table,' said Professor Midgley, 'but there was concerted effort and investment over two years by the Department of Agriculture in its implementation. This included extensive and regular communications to the agricultural sector at conferences and farmers' meetings, as well as via a quarterly newsletter and a 15-minute weekly radio slot for a year." According to Dr Trautmann, SmartAgri was developed to provide a roadmap for the agricultural sector towards climate change resilience and sustainability. She says the plan is a living document that will “grow” as the sector identifies more ways to adapt and mitigate against the impact of climate change. The development of the plan was a “Better Together” initiative between the Department of Agriculture, Department of Environmental Affairs and Development Planning and the ACDI as service provider. This partnership model, which includes all agricultural stakeholders, is pivotal to the implementation of the plan in the years to come. "One of the reasons for entering SmartAgri was to showcase how a sector plan can be innovatively implemented using novel approaches and by using current and new awareness and information dissemination tools and vehicles," said Dr Trautmann. The award was based on evidence provided for the year 2017/2018 as per the award requirements. The Awards, which began in 2014, are aimed at rewarding good performance by public servants. A total of eight categories were contested, showcasing individual, team and departmental excellence for leadership, ethics, implemented programme, Batho Pele principles, as well as innovation in the public service. This year's awards received a record 86 nominations in total. The provincial Department of Agriculture also received a Gold award for the Best Overall Batho Pele Citizen Centric Public Servant and a Silver Award for the Best Public Service Innovator for the development of its very popular online tool Cape Farm Mapper which is also part of SmartAgri.